The Montevideo “Waste Law”, initiated by the Municipal Department of Social Development in 2004 requires companies that produce waste to develop a waste management plan to avoid environmental contamination. The city, now focusing on the recycling aspects of this law, wants the waste pickers to formalize into businesses. The law requires that the organizations that win the public bid contract waste pickers and manage their operations, controlling their work hours and and the neighborhoods in which they collect recyclables. Once this system is in place, the waste pickers will receive a minimum wage in addition to a percentage of the profits earned from selling the recyclables they collect. 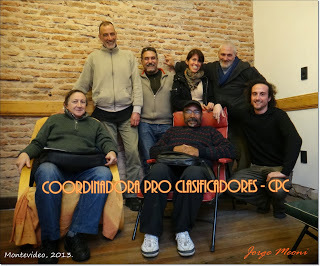 The Coordinadora Pro Clasificadores (CPC) is a civil society space formed in April of 2013 that focuses on socioeconomic integration and socially responsible waste management to support informal recyclers. Made up of many diverse organizations, including waste pickers cooperatives, the CPC held meetings in 2012 and 2013, in which it produced and submitted an extensive amount of input to the municipal government to implement in their public bid process. None of that feedback was considered. The public bid process, carried out in September, did not bring forward any organization or cooperative. In September, the CPC made a series of denunciations. In addition to criticizing the municipal government for not considering its suggestions, the CPC denounced the government’s disregard for an array of exemplary work experiences represented by the waste pickers and civil society. The CPC also stated that the public bid is legitimizing miserable salaries if one is to consider the demanding nature of informal recycling as well as the amount of hours waste pickers will realistically end up working. The group also criticized the contract terms of adding to the waste pickers’ salaries only a percentage of the earnings from selling the recyclables rather than the full amount. “With such low salaries, it will be difficult to rise out of chronic poverty and social vulnerability that the majority of waste pickers and their families face,” the release stated. In addition, CPC criticized that the government has not shown concern with protecting waste pickers through social security and labor rights.